Level 1 Primary Protection. To find your correct size stand and measure the calf in question (you knew this). Measure at the fullest part of the calf. 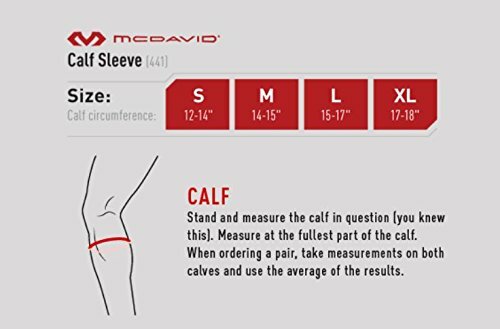 When ordering a pair, take measurements on both calves and use the average of the results. Size small fits 12 - 14 inches, size medium fits 14 - 15 inches, size large fits 15 - 17 inches and size extra large fits 17 - 18 inches. 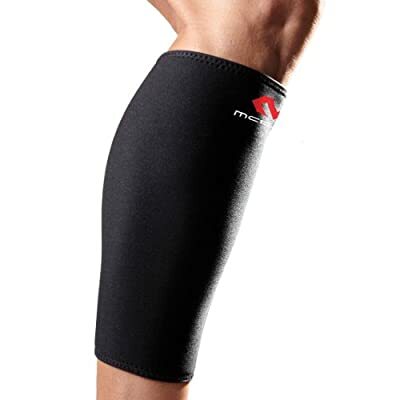 The McDavid deluxe calf support adds warmth, compression, and support for calf strains, shin splints, and varicose vein problems. The support is contoured with a four-way stretch material for optimal fit and performance. The long thermal neoprene sleeve, meanwhile, includes nylon facings on both sides for comfort. Fully reversible, the support also offers a heavy-duty nylon outer lining for durability.